Looking for a complete makeover? Or, maybe you just need a little touch up. It may not come as a surprise to you that there is an abundance of salon choices in Los Angeles. However, if you’re looking for top of line service and quality, visit these top five salons. Each has a different atmosphere, while offering you a more personalized experience, whether it may be for your hair, skin, and/or nails. 1. Sola Salon Studios has many locations surrounding LA, twelve to be exact. The LA Sola Salon is located at 12121 Wilshire Blvd Suite, Los Angeles, CA 90025, 310-954-1516. Each studio is set up for the stylist or independent salon owners to have their own personalized space, showcasing their taste in furniture and decor, and secure 24/7 access. This allows the client to receive a much more private, intimate setting where they can receive one-on-one attention. Sola Studios provide additional benefits for the stylist, such as; creating their own schedule, selling retail that they love, and having a move-in ready, high-end studio. Sola also offers education and training to keep the professionals up to-date on the latest trends. 2. Works of Art Hair Salon has maintained it’s laid back, loft-style atmosphere for over a decade, as the owner, “Art”, has hosted many art gallery openings at his very own salon as a result of his own love for artwork. This salon is located near Hollywood Boulevard and entertainment district with several accessible restaurants and shopping. You will find Works of Art Hair Salon at 4655 1/2 Hollywood Blvd, Los Angeles, 90027, 323-667-0072. Many of the stylists have an extensive beauty industry background including, but not limited to; freelance stylists in the entertainment industry, platform artists, educators for major companies, photo shoots, or commercials. Art’s salon vision is for each client and stylist to feel comfortable, while experiencing a fresh and exciting atmosphere. You don’t want to miss out on their favorite products and/or services that are featured every few weeks. 3. Heretic Salon offers a variety of services to both men and women. The staff takes pride in their very professional, welcoming, and fashion forward atmosphere. Stylists are always ready to deliver the look you desire, whether it’s conservative or a little more exotic. Reputably quite talented and versatile, Heretic Salon is located in Los Feliz, specializing in hair extensions and dreadlocks. You will find Heretic Salon at 1724 N Los Angeles, CA, 90027, 323-666-2965. 4. 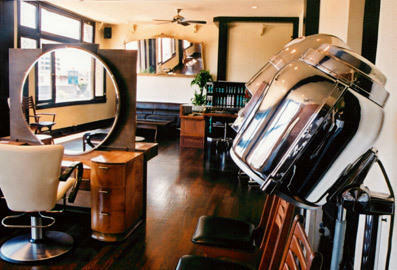 Salon Eleven, located in Downtown LA, 420 W 11th St, Los Angeles, CA, 90015, offers a trendy and upbeat environment. You can reach them at 213-744-9944. Staff believes in empowering their stylists to better service guests’ needs. They continue to maintain their established genuine customer satisfaction approach. Stylists have extensive backgrounds in the beauty industry, and a passion of delivering pure excellence to their clients. Salon Eleven highly encourages clients to take the time to review their experience. 5. Hairroin Salon, located near Sunset Boulevard, 1520 N Cahuenga Blvd #2, Los Angeles, CA, 90028. Also located in the heart of Hollywood, you can reach them at 323-467-0392. Clients receive a salon experience that is completely redefined by the creativity of Hairroin Salon stylists; each specializing and excelling in the services performed. They continue to raise the bar of the beauty industry by frequently being featured in music videos, commercials, magazines, numerous editorial articles, films, and runway. You will also find Hairroin’s sister salon located in New York City.